Model updates: Honda’s CRF250R gets a brand new DOHC engine, making 9% more peak power over a much broader rev range with higher redline; it also features electric start as standard. The 18YM CRF250R also shares its complete mass-centralised chassis with the CRF450R, including steel-sprung 49mm Showa USD front fork. When it comes to competition it doesn’t get much tighter, or more committed than the MX2 class. And Honda’s CRF250R has consistently proved a worthy weapon for battle. It is a machine that has evolved over time, through increments and steps, into a base platform that the amateur MX enthusiast – as well as pro-racer – can get the most out of. But the game moves fast and the 18YM CRF250R is making a giant leap, inheriting the Absolute Holeshot philosophy of the 2017 CRF450R. With its seventh generation frame, revised geometry and Showa suspension, evolution has been firmly replaced by revolution and it’s now armed with the exact same chassis as its CRF450R sibling plus a brand new DOHC engine. Why? 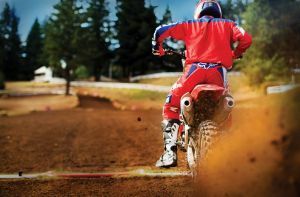 Top racers always want – and crucially can use – more power and the new CRF250R is designed purely around what Honda’s moto-cross racers require to do their job. Of course with its switchable engine mapping and rider-focused ergonomics it’s still a moto-crosser that the hobby rider can exploit to their individual level of ability. But the 18YM CRF250R’s performance parameters, in terms of output and handling ability, have been elevated with only one aim in mind. To put a winning machine into the hands of those that can win. The 18YM CRF250R leaves the 17YM CRF250R in its roost with a kW/Kg improvement of 5%. In a wheel-to-wheel test the new CRF250R is 3% faster from 0-10m and 3.6% quicker over 30m. That’s close to half a bike length, and a full bike length respectively. Its DOHC engine, with over-square bore and stroke, bigger valves and revised inlet/exhaust setup makes a hefty 9% more power up top, for far longer, with extended over-rev and higher redline. Out of the gate, and lap after lap, the 18YM CRF250R is built to pull out an advantage and cut lap times. And the 18YM CRF250R’s new fully mass-centralised chassis – identical to the current 18YM CRF450R – can put the extra power to effective use, its geometry and lower centre of gravity driving the rear tyre into the ground harder. The new CRF250R also employs the same Showa 49mm steel-sprung front fork as the CRF450R offering familiar (and extensive) levels of adjustability. Like the CRF450R, the CRF250R’s plastics outline neat aerodynamics and a smooth, organic shape giving the rider ample freedom to move. They also feature scratch-resistant film insert graphics, which deliver sharp visuals and a durable finish. Like the 2018 CRF450R, the new CRF250R is fitted with an electric starter as standard equipment. The 18YM CRF250R DOHC engine is a clean sheet design and has been built with the focus on top-end power for acceleration and drive, plus improved over-rev corner-to-corner. The simple facts: it makes 9% more peak power with a spread that delivers that power over a 2,000rpm higher range, and also features a 900rpm increase to the ‘redline’ figure. And the dyno graphically tells the story. From 8,500rpm the 249.4cc engine simply takes off compared to the previous model and keeps building power and torque as the revs rise. Central to the improved performance – which is all about much higher gas flow, in and out – is a revised bore and stroke of 79 x 50.9mm, with a 4.5mm cylinder offset to reduce friction (as opposed to 76.8 x 53.8mm, 4mm offset). This is a much more ‘over square’ layout, with bigger bore and shorter stroke which allows the use of larger titanium valves: 33mm inlet (which feature a neck shaped to reduce intake resistance) and 26mm exhaust (30.5mm/25mm). Lift is also increased: 10.5mm inlet and 9.5mm exhaust (9.2mm/8.4mm) and the valve angle is more compact, going from 21.5° to 20.5°. The rocker arms feature Diamond Like Carbon (DLC) coating, a Nano-thin hard film that provides high wear resistance and lubricity; the valve springs themselves are now oval in section. The inlet valves are fed – via PGM-FI with 46mm throttle bore – by symmetrical straight-shot downdraft intakes, which are shorter for improved high rpm snap. The new engine features twin exhaust ports, each of which has its own exhaust down pipe, with bends that radius gradually to smooth out gas flow. The twin mufflers are sited 24mm inward toward the centre of the machine, to aid mass centralisation. Compression ratio goes up slightly from 13.8:1 to 13.9:1 but the piston shape is now a Bridged Box design – the first on a Honda MX machine. Its rigidity converts combustion pressure into high output efficiency and, despite the bore increase, the piston carries no extra mass. Four piston jet oil holes (rather than two) reduce friction and ensure optimised cooling. The new H-Section crankshaft is 350g lighter while maintaining inertial mass, for response and stiffness, and rigidity. To make the engine as physically compact as possible the axis distance between the crank and balancer shaft is reduced by 0.5mm, and 1mm between the crank and primary gears. The cam chain is now on the right, to shorten the distance between the crankshaft and the mass of the Alternating Current Generator (ACG). Incorporated into the CRF250R’s new engine is an electric starter motor, replacing the kickstarter. Located centrally (the new crankcase layout ensures all inertial masses are closer to the C of G, for improved handling), it drives the one-way clutch and idle gear via a press-fit torque limiter; its Lithium-ion battery is compact and weighs just 0.65kg. Engine weight with the electric starter added is increased by just 1kg. A scavenge oil pump system reduces friction and ‘pumping’ losses at high rpm, by discharging oil and air in the crankcase and maintaining negative pressure. The oil also lubricates the clutch and gearbox – total oil capacity 1250cm3 – as opposed to 850cm3 engine and 750cm3 gearbox of the previous design (1600cm3 in total). The combined oil pump/drive gear, oil filter and oil way are on the right side of the engine; the oil’s path around the engine has been simplified, shortened and valve train lubrication is routed through the cylinder head to the inside of both inlet and exhaust cam, directly feeding the sliding surface of cam and rocker arm. Lightweight water hoses are now 3mm, rather than 4mm in wall thickness. While exactly the same physical size as before the clutch outer features a revised clutch basket. Delivering consistency in hard use it utilises differing friction material on the two outer plates. The clutch lever housing is also redesigned, simplified and lighter. The 5-speed gearbox is constructed from new, high-strength steel and is 200g lighter; it also uses slightly shorter gear ratios for first and second, and the final drive ratio drops one tooth to 48T on the rear sprocket. The engine stop switch and Engine Mode Select Button (EMSB) are incorporated into a small housing on the left side of the handlebar. Three maps are available to suit riding conditions and rider preference: Mode 1 (Standard), Mode 2 (Smooth) and Mode 3 (Aggressive). A small indicator light displays Mode selected. On the right of the handlebar is the starter button. The resin slider of the throttle housing is now incorporated into the throttle cable itself, reducing load; a knurled nut adjusts free play. The 18YM CRF250R employs the same frame and suspension setup as the current CRF450R, with the same basic aims; connect the rider to the terrain with superlative feedback and gain rear wheel grip and drive through a rearward shift in weight bias, tied to a lower centre of gravity. Saving 340g over the previous design the seventh-generation aluminium beam frame features tapered main spars with a carefully tuned balance between rigidity and flexibility, designed to deliver front-end stability plus a direct feel for traction. Compared to the outgoing CRF250R design the chassis’ geometry markedly differs; wheelbase is 3mm shorter at 1486mm and the distance between the swingarm pivot point and rear axle is 15mm shorter at 573mm. Rake is set at 27.5° with trail of 116mm. The C of G is 1.4mm lower. The rear subframe is now extruded aluminium (rather than forged) and is 20% lighter, aiding mass centralisation. Seat height is 6mm taller at 957mm, with 5mm more ground clearance at 327mm. Wet weight (without fuel) is 103.3kg, with fuel 108.1kg. The Showa SFF-TAC-Air front fork of the previous model has been replaced with a 49mm Showa USD coil-spring fork. Debuted on the current CRF450R it’s not an evolution of the older 48mm fork, but a version of the Showa kit fork supplied to MX race teams in the Japanese championship. The cylinder has a 25mm diameter, the rod 14mm with the compression piston 39mm. As you’d expect from what is effectively full race-spec suspension the fork action is supple, smooth and always in control. It’s also fully adjustable. With a top mount 39mm lower and located directly on the machine’s centre line the fully adjustable Showa rear shock works the aluminium swingarm – 220g lighter – through Pro-Link. A 260mm wave-pattern disc delivers effective heat dissipation, power and feel from the two-piston brake caliper working it; a matching 240mm wave-pattern disc and single-piston caliper is at the rear. Lightweight aluminium rims, with directly attached spoke pattern layout reduce unsprung weight; the front is a 21 x 1.6in, the rear a 19 x 1.85in. Fitted as standard equipment are Dunlop’s GEOMAX MX3S tyres, 80/100-21 front and 100/90-19 rear. The new 18YM CRF250R also shares the CRF450R’s 6.3L titanium fuel tank, which at 1039g weighs 513g less than the plastic design it replaces. The loss of half a kilo sat high on the machine contributes to the lower C of G, and the flattened tank cap and lower profile enables the rider to move forward easily. Wearing plastics with smooth external lines to help the rider move easily the frontal area is also narrower; the front mudguard directs a more efficient funnel of air to the radiator. The bodywork also uses durable film inset graphics that cover a wide area with scratch resistant style.